The curb inlet guard is an inlet protector which prevents debris, trash, and other large material from entering a curb drain. Depending upon the needs of the site, two model options are available – insert and modular. Constructed from different filtering materials, both curb guards are able to withstand exposure to debris, as well as UV rays, water, and other outdoor elements. Construction of the modular curb drain guard features a combination of wedges and drain protectors in a woven, polypropylene material. Wedges fit at the end of each drain protector, keeping it in place. Multiple drain protectors can be inserted for extended lengths. Made from recycled synthetic fibers, the insert model drain gutter guard uses two heavy-duty tension rods. The rods keep the material secured inside the curb drain. The flush-mounted installation keeps the curb inlet guard from interfering with street sweepers or possibly tripping pedestrians. Questions about storm drain inlet protection? We can help! Call the GEI Works team at 1-772-646-0597 or fill out our quote request form to discuss your requirements. Questions about the drain gutter guard? We can help! Call the GEI Works team at 1-772-646-0597 or fill out our quote request form to discuss your storm drain inlet protection requirements. How Does a Curb Drain Silt Guard Keep You in Compliance? 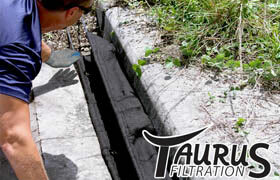 The Taurus Curb Inlet Filter provides significant cost savings due to it's incredible field life. This stormwater BMP fits directly into the mouth of storm drains, providing curb inlet protection. Street sweeper friendly and invisible, it takes just seconds to install. Regular maintenance can keep these curb guards functioning for much longer than comparable products. For more information on curb inlet protection, visit our Drain Catch Basin page.